Gallimimus was a fast-running dinosaur that lived in Mongolia in the late Cretaceous period, about 75 to 70 million years ago. Gallimimus was about 13 feet (4 meters) long, and weighed around 60 pounds (27 kilograms). Gallimimus had a long snout ending in a beak, and its hands seem better suited to digging than to grasping. Some scientists believe that Gallimimus may have dug up other dinosaurs' eggs buried in sand, and then cracked them open with its beak. 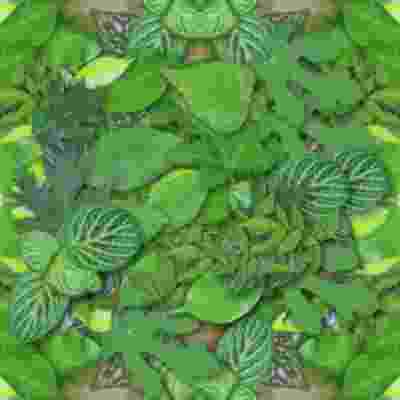 Another possibility is that it may have been an omnivore, eating small animals, insects, and perhaps some plant material, as well as eggs. Gallimimus had hollow bones similar to modern birds. It also has a number of adaptations suggesting that it may have been a fast runner. These include long limbs, a long tibia (the shin bone) and metatarsus (the long bones of the foot), as well as short toes. The first fossils of Gallimimus were discovered in the early 1970s, and the creature was named in 1972 by Rinchen Barsbold, Halszka Osmólska and Ewa Roniewicz. Asian Dinosaurs - Gallimimus lived in Mongolia. Gallimimus was a genus of dinosaur. 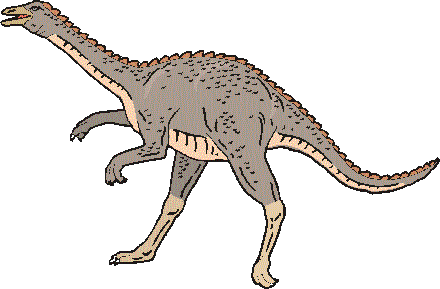 Gallimimus was a member of the Saurischia ("lizard-hipped") order of dinosaurs. What this means, is that although Gallimimus was not closely related to lizards, it did have similarly shaped pelvic bones. Gallimimus was a Theropod - a member of a group of related bipedal dinosaurs that included the ancestors of birds (although Gallimimus was not itself an ancestor of birds). Gallimimus lived between about 75 million years ago and 70 million years ago, during the late Cretaceous period. Gallimimus was a omnivore (ate both meat and plants). Gallimimus was about 13 feet (4 meters) long. Gallimimus weighed about 60 pounds (27 kilograms). A top sprinter, Gallimimus can outrun most dinosaurs. The fast biped accelerates much like a car merging onto a highway. It eventually reaches a speed of 50 miles per hour. In this children’s book, meet a dinosaur that excels at the game of tag! This chapter book touches upon many important themes: immigration, racism, and acceptance. It tells the story of a friendship between a boy named Carlos and a girl named Aila, who moves to Spain from Africa with her father. Shunned at the first, the townsfolk from Alcamilla realize that they were wrong to have looked down upon the newcomers the way they did. G is for... George the Gallimimus is the 7th book in the My Dinosaur Alphabet series. It follows the adventures of George the dinosaur as he goes in search of things beginning with the letter g, and he asks for the reader's help in doing this. Colourful illustrations help make this book fun to read. It is an interesting way for children to learn their alphabet and some new words. Written by an author who is qualified as a teacher of English as a second language in a simple format, so that it is easy to read and understand. The book is aimed at children from 2 to 6 years of age, including young ESL readers. The first books in this series reached the top 20 best sellers in the Early Learning category for New Releases. Get ready for thrilling action and adventure with Jurassic World toys! Realistic sculpting and authentic decoration. The Jurassic World Legacy Collection roars into action celebrating classic moments, themes and characters from the blockbuster film franchise! 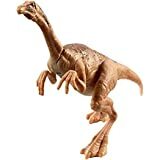 These dinosaur action figures feature articulated arms and legs, realistic sculpting and authentic decoration. Get ready for thrilling action and adventure with Jurassic World! Attack Pack dinosaurs are inspired by the movie and are known to herd, hunt and attack in packs. Each Attack Pack dinosaur figure includes five points of articulation, realistic sculpting and authentic decoration. Each two-Pack also features one of the Attack Pack dinosaurs with special decoration. Choose from the following two-Packs: Velociraptor Blue and Dimorphodon; Velociraptor and Gallimimus; and Dilophosaurus and Dimorphodon. Collect them all! Each sold separately, subject to availability. Colors and decorations may vary. Are you the ultimate dinosaur expert? Download the Jurassic World Facts app to bring your Mattel Jurassic World dinosaur figures to life and learn fun facts! 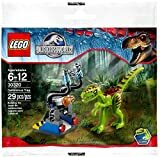 Add to your Jurassic World LEGO collection with this Gallimimus Trap Set 30320, an exclusive LEGO polybag. This rare 29 piece bagged set includes 1 unique Gallimimus [dinosaur] and the components to build 1 trap. 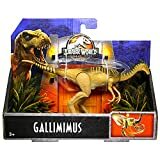 Legacy Collection Gallimimus Poseable Dinosaur Figure 4"